A guest is our most important visitor. Joceylin Karigl-Reyes was born under the zodiac sign of Leo. As Assistant Manager, she exudes the qualities of Leo, namely: cordiality and friendliness combined with professional competence and leadership abilities. She gained international working experience while living and working in the USA, Canada and Germany. 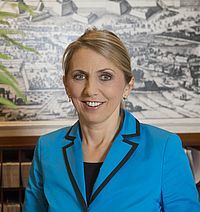 Before taking over her position at Hotel Austria, she worked as Executive Housekeeper in several international hotels in Vienna. Mrs. Karigl-Reyes is married and a mother of two, now both grown-ups. Her favourite hobbies include painting, sculpting, listening to music, dancing and reading. Get a glimpse of her creative talent in the seasonal decorations in the hotel. Her motto: It is not enough to meet the expectations of our guests, but strive to exceed them! Hermann was born under the zodiac sign of Virgo. Typical for this sign are attention to detail and a practical capability. With these characteristics, our youngest team member attends to all departements, wherever an extra pair of hands is needed. Hermann gained his first experiences of his career in tourism in different areas of Austria – his last assignment took him to Hohentwiel in the region of lake Bodensee. In his free time he likes to play football, to take care about his garden and to meet with friends. Mrs. Renate Bassrucker was born under the zodiac sign of Capricorn. With the typical loyalty of the Capricorn she has been working at Hotel Austria for 25 years already. Our guests appreciate her personal charm and her excellent professional competence. Mrs. Bassrucker always has an open ear for all the wishes and concerns of our guests. Mrs. Bassrucker is a mother of two children. Her hobbies, which include reading, skiing and jogging, enable her to combine professional and private life ideally. Her motto: Through my personal commitment, I strive to encourage new visitors to become frequent guests. Mr. Piero Anzalone Gherardi was born under the sign of Cancer. With the typical Cancerian qualities of readiness to help and attentiveness, he is strongly contributing to the Reception team’s efforts. He lends an open ear to all concerns and stands ready by your side with advice and acts of helpfulness for your requests. Mr. Piero Anzalone Gherardi came from Rome and has lived in Austria for many years. He is married and a father of two girls. His hobbies include swimming, running and cycling. He is also a passionate and excellent cook and has a few secret tips handy about excellent Italian restaurants. 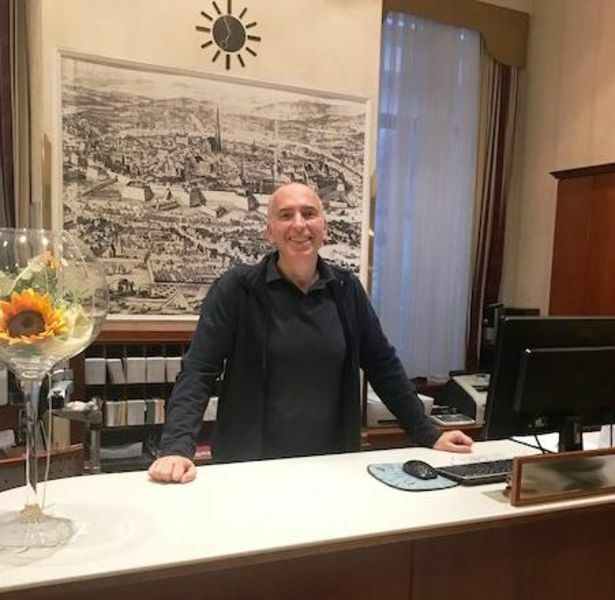 His motto: That through his efforts, he could contribute to making our guests’ stay at Hotel Austria a memory truly worth keeping. Mrs. Liza was born under the sign of Virgo. With the typical attentiveness of the Virgo, she has reinforced our reception team very well. With her youthful charm and elan, she is an asset at our reception and contributes to making your stay as pleasant as possible. Mrs. Liza comes from Upper Austria and has been living in Vienna for a long time now - after living overseas in Spain and England. She is very interested in culture. Reading and primarily dancing count as her hobbies. Her work-aim: Through her contribution, our guests can always feel at home at Hotel AUSTRIA. Mr. Hakan was born under the zodiac sign of Pisces. With the typical helpfulness of this sign, he always has an open ear for the intentions and wishes of all the night revelers and early risers among our guests. 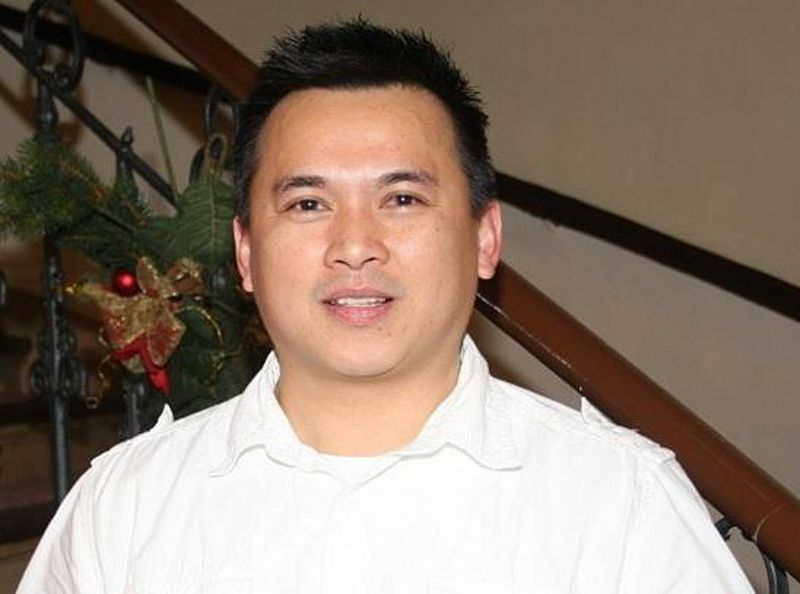 Not only does he makes sure you are in good and safe hands during the night, but also would gladly serve you a cup of coffee or a small breakfast during the wee hours of the morning. 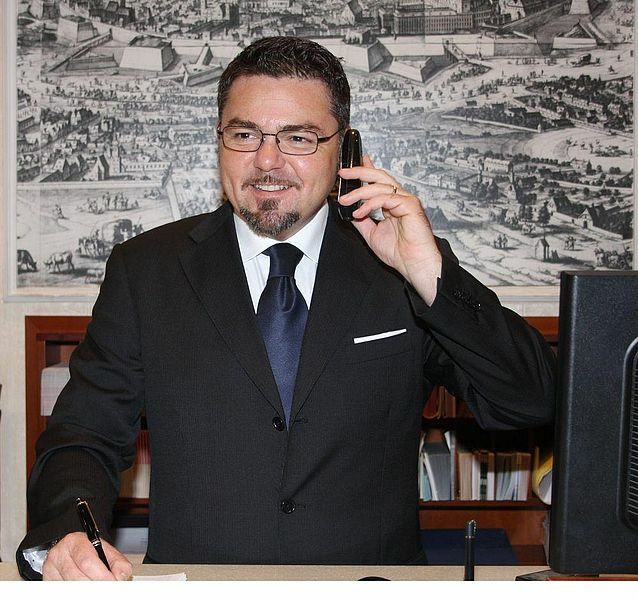 His motto: Through my work I contribute in making our guests feel safe and in good hands also during the night and enable them to enjoy a peaceful and good night’s rest. Mr. Philipp was born under the sign of Aquarius. With the typical Aquarius’ quality of friendliness, he "holds the fort" during the night hours and makes sure that our guests have a competent contact person available for all of their concerns. 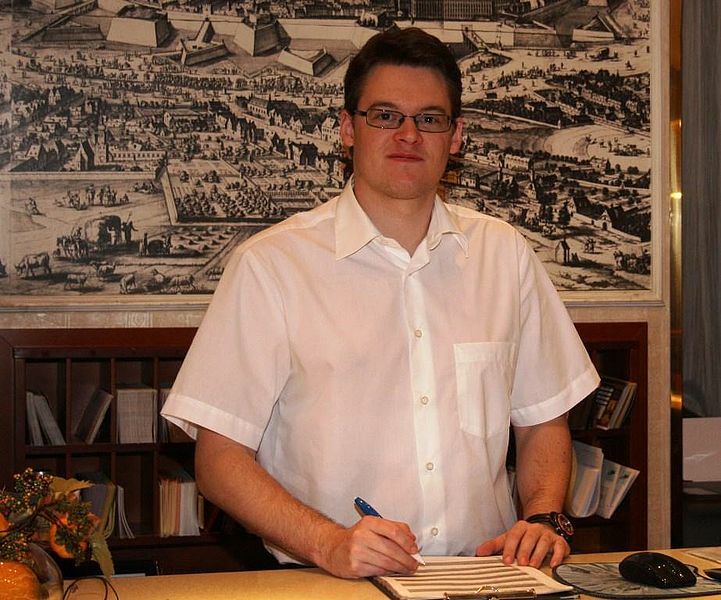 Mr. Philipp is a student of pharmacy at the University of Vienna aside from his work at Hotel AUSTRIA. His hobbies include baseball and reading. Ms. Vehida was born under the sign of Taurus. With the typical calmness and naturelness of this sign, she is the kindred soul in our breakfast room. 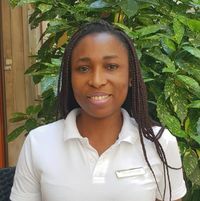 With her work and service, she ensures that our guests at Hotel AUSTRIA feel that they're in good hands and never miss out on every comfort or convenience offered. Ms. Vehida came to Austria many years ago from Bosnia. She is married and mother of 2 children. She likes to spend her free time in a creative way with drawing and she loves reading. Her motto: Through my work I try to help make our guests feel “at home” in our guestrooms. Mrs. Tao Du was born under the zodiac sign of Libra. She is a wonderful addition to our team with her typical Libran balance and is an asset to everyone with whom she works. Always calm and attentive, she supports our team in breakfast service and in housekeeping. Mrs. Tao Du comes from Inner Mongolia. She is married and is a mother of two. Her free time belongs mostly to her family. Aside from this, she loves to read and to surf the internet. 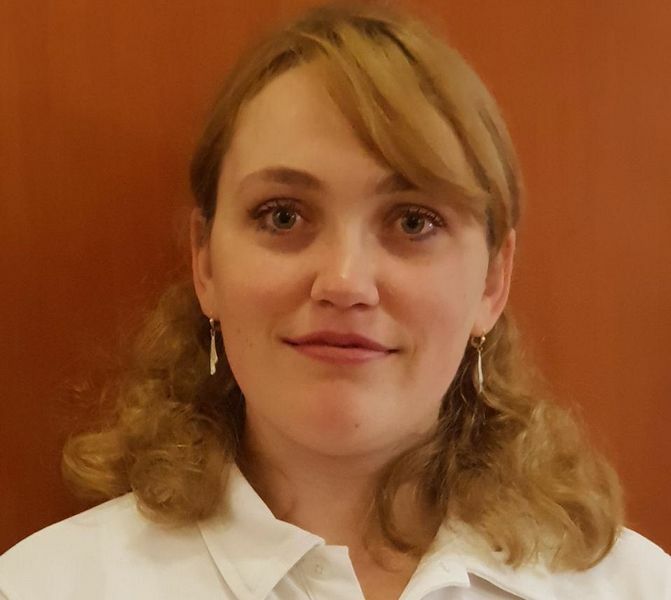 Her Motto: Through her work, to share a smile and friendly words to our guests and thereby contribute to the best possible start in a new day. Frau Donnaly was born under the sign of scorpio. She supports our team with her typical mutability and has become a great addition to the staff. Always with a good disposition, she provides service during breakfast time for a good start in the day. Frau Donnaly comes from the Philippines. She is married, a mother of 2 boys. She likes to sing – and sings very well – and she spends her free time mostly with athletic activities like hiking and biking. 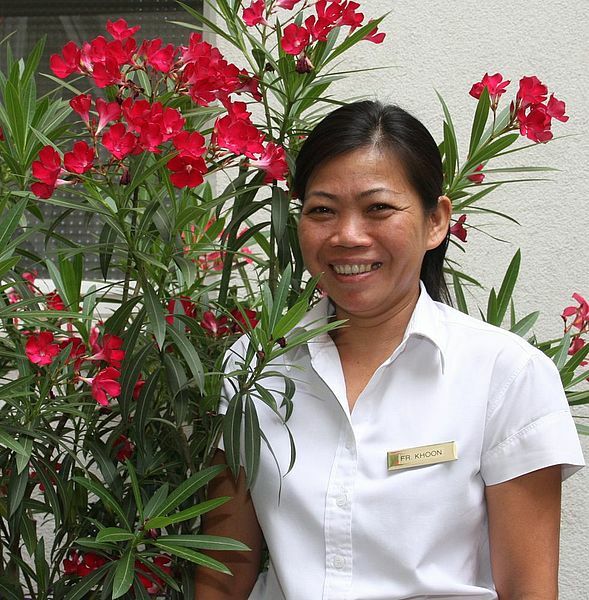 Her motto is to make the best possible start in a new day with her work, a smile, and friendly words for our guests. preparing our warm dishes. 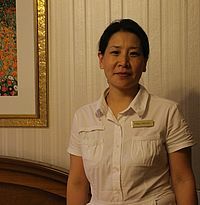 With her dedication to her floor duties, she also takes care of the well-being of our guests, who really appreciate it. Ms Loredana originally comes from Romania, but has been living in Austria for several years. She is married and a mother of 2 children. Her free time belongs above all to her family, however, she also enjoys taking walks, reading and listening to music. Her motto: Through my commitment, I want to make sure that the best service is offered both for breakfast and in the guest rooms. Mrs. Khoon was born under the zodiac sign of Gemini. With her typical Gemini thoroughness, meticulousness and cheerfulness, she takes excellent care of our rooms on the fourth floor. She has been a trusted face for our guests for a lot of years now. Mrs. Khoon came to Austria many years ago from Thailand. In private, she is a passionate cook and spends her free time doing sports activities like swimming as well as dancing. Her motto: Through my duty I contribute to making our rooms a place where one can feel good. 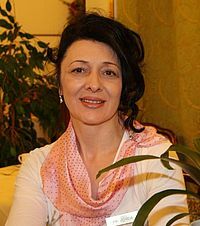 Mrs. Slavica Ivanic was born under the sign of Libra. With the Libra’s typical equanimity, she has for many years now been in charge of our rooms at the 3rd floor, which for our guests has always been a place to feel good. She also helps eagerly whenever extra help is needed during breakfast buffet service. Mrs. Ivanic comes from Bosnia although Austria has already become her second home. Privately, she is married and a mother of two chiildren. Her favourite pastimes include reading, cooking and sewing. 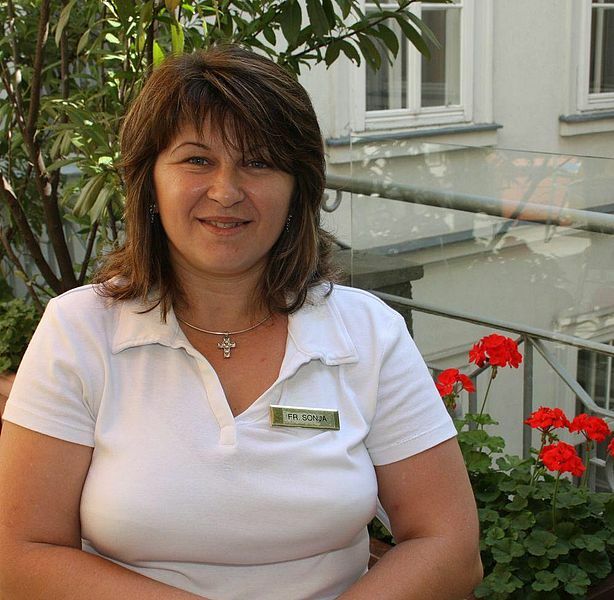 Her motto: Through my work HOTEL AUSTRIA should be a place where one not just lives but also feels at home. Ms Sonja Risteska was born under the sign of Aries. With the typical Aries qualities of vitality and spontaneity, she makes it a point that our guests always feel at home. Ms Sonja came to Vienna years ago from Macedonia. She is a mother to one daughter with whom she has been very eager to discover the still unknown sights of Vienna. 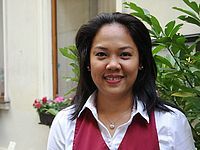 Her motto: To ensure through my work that your stay at Hotel AUSTRIA would become an unforgettable experience in all areas. Ms Esther was born under the sign of Taurus. With the typical naturalness and calmness of this sign, she reinforces our housekeeping team on the first floor. She is always happy to fulfil all your wishes and requests. Ms Esther is originally from Nigeria, but has been living in Austria for many years now. She is the mother of two children. Her free time is devoted to her family, futhermore she loves to cook and to listen to music. Her Motto: I do everything to make sure that our guests are satisfied. Mr. Sasa Petrovic was born under the sign of Taurus. 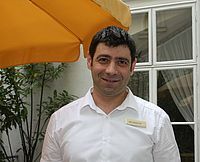 With the Taurus’s typical loyalty, he has been the “good-natured spirit” in Hotel AUSTRIA since 1999. With his knack for technical handiwork, he fixes not just the technical problems in our hotel, but through his work also ensures that our guests feel well wherever they are inside the hotel. 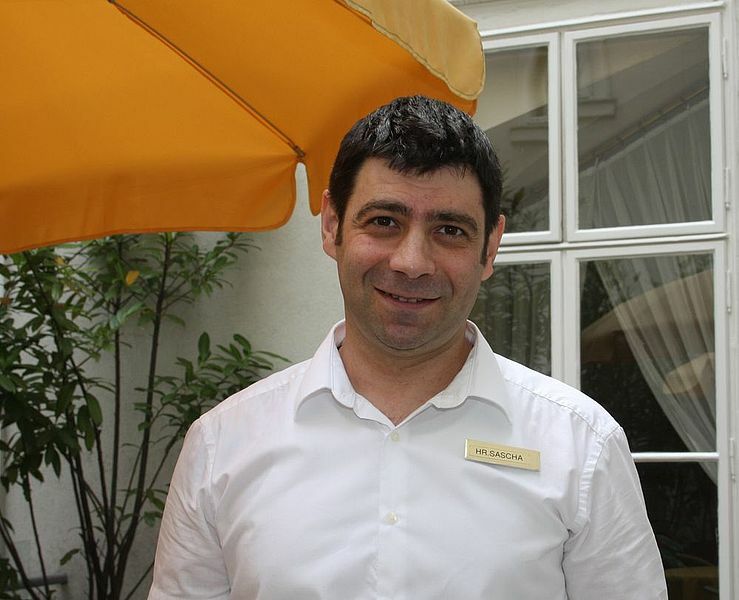 Mr. Sasa Petrovic comes from Serbia-Montenegro and has been in Austria for more many now. Austria has for a long time become his second home. His hobbies include cooking, reading, running and inline-skating. He is married, the proud father of 3 children and has proven time and again that not only does he have a lot of humour, but also a lot of heart. His motto: Through my work I want to make sure that also at the background areas everything works smoothly at all times! Mr. Richard comes from the Philippines and has been living in Vienna for some time now. He is married and father of 2 children. His most favourite hobby is playing tennis. 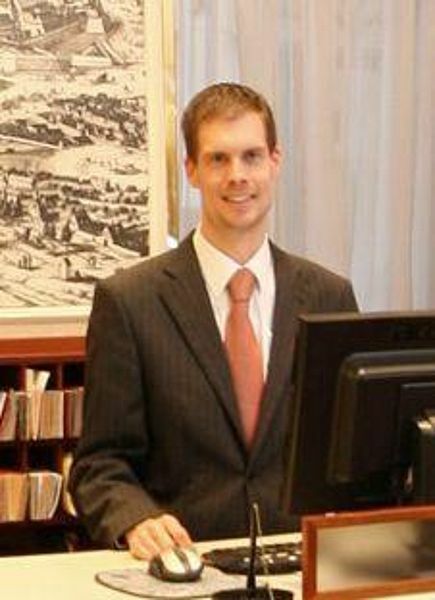 His motto: With my work, I hope to help our guests start. Mr. Dauti was born under the zodiac sign of Cancer. With the typical helpfulness of Cancer, he is our „Man in White“. Mr Dauti is the expert for painting, paperhanging, repairing floors and all kinds of things needed to keep the rooms in good and safe condition for your convenience. Mr. Dauti came from Kosovo to Vienna in 1991 and is proud father of two grown-up children and dotes on his grandchildren. His spare time he likes to spend with his family and whenever time allows, he likes to read. His Motto: I want to make sure that our guests feel „at home“ in the rooms of our hotel. 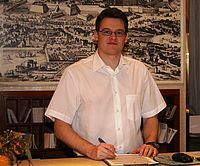 Klaus Lechner was our Reception Manager from 2004 to 2009. He was most unexpectedly taken away from his life, a totally shocking truth for all of us. 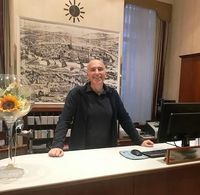 With his extraordinary expertise and most importantly, his remarkable humaneness, he drastically shaped and molded Hotel AUSTRIA five years long. Klaus Lechner was not only an outstanding individual, he was also most especially a human being with a lot of HEART. Here you can read our Farewell Letter again.